If you’re anything like me, you have a hard time choosing when the dessert tray is offered at your favorite restaurant and you see that towering slice of New York Cheesecake. Always wanting to try something new or different, I usually try to steer away from cheesecake because I know I love it and I want to try something different. But most of the time I end up having order envy because my husband’s go-to dessert at almost any restaurant is cheesecake, and I have to end the meal ogling his luscious slice of heaven, hoping for a bite or two. Lucky for me, he usually spares me at least one bite after an “I told you so” moment. 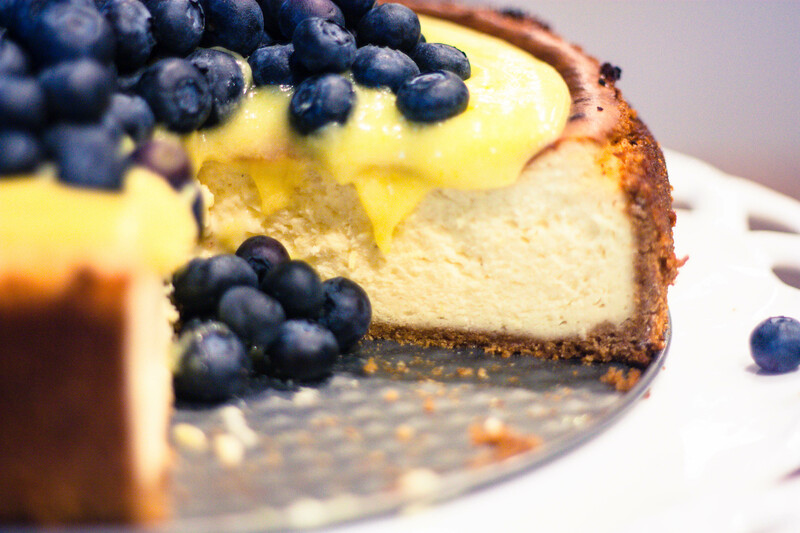 New York Cheesecake has a dense, smooth and creamy texture, and it’s my favorite kind. 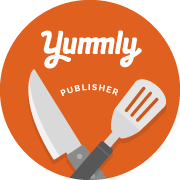 I have tried many recipes for New York cheesecake over the years, and after testing and tweaking, I have finally found the perfect recipe for my home kitchen. Making cheesecake at home can often be intimidating, but this one is surprisingly easy and you’ll be able to proudly indulge family and friends with a special homemade dessert. You can leave this cheesecake plain and it’s heavenly all on it’s own, or you can top it with many different toppings from creamy chocolate ganache to caramel, to sweetened berries and more. 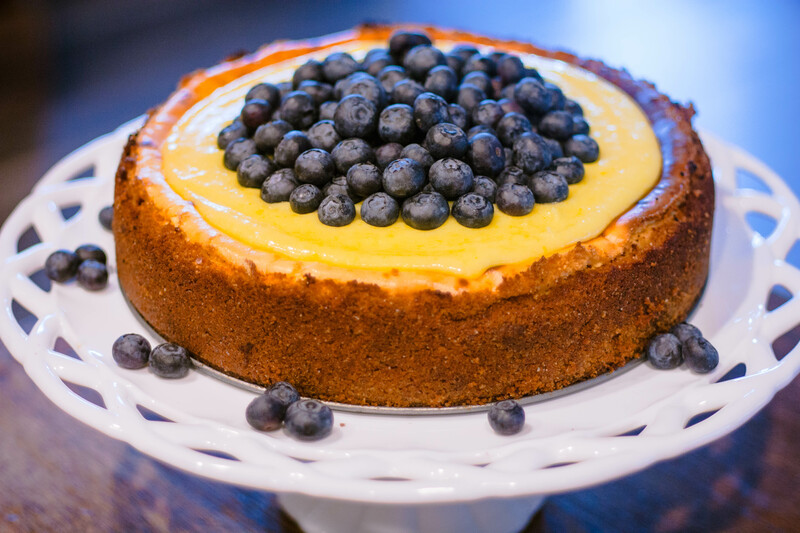 For my husband’s birthday this year, I made this New York Cheesecake and topped it with homemade lemon curd and fresh blueberries (his favorite). The Lemon Curd recipe is included in this post. 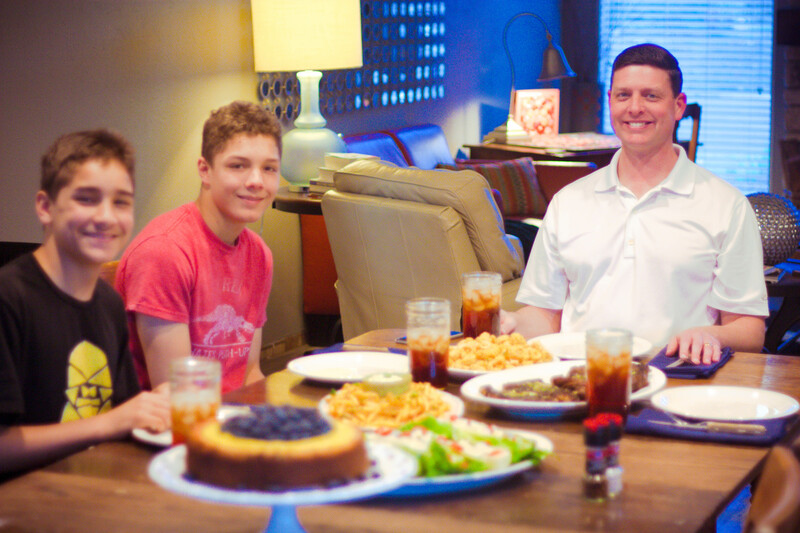 One of the best gifts I can give my husband on his birthday is a home cooked meal. For this special meal we had Fried Calamari, Grilled Ribeye Steaks, Wedge Salads, Truffle Fries, Sweet Tea and New York Cheesecake! Combine all ingredients in a medium bowl and stir to combine and moisten all ingredients. Press onto the bottom and up the sides of a 10½ x 30inch springform pan. Combine the softened cream cheese and sugar and place in the bowl of an electric mixer, with the paddle attachment. Beat on medium speed for about 3 to 4 minutes, or until smooth and creamy. Scrape down the sides and bottom of the bowl and paddle with a rubber spatula. Add eggs and egg yolks one at a time, beating for 2 minutes between each addition. Add salt and vanilla and beat for an additional 1 minute. Place chilled pan with crust onto a large baking sheet. Pour the cheesecake filling into the crust-lined pan and smooth the top with a rubber spatula. Place into a 500 degree oven on the center rack. Loosely cover with foil and bake for 12 minutes. Lower heat to 200 degrees. Uncover and bake at 200 degrees for an additional 40 minutes or until an internal temperature of 150 degrees. If you notice the top browning too much, loosely cover with foil to prevent further browning. In a stainless steel bowl, whisk together the eggs, sugar, and lemon juice until blended. Place bowl over a saucepan of shallow simmering water. Cook, whisking constantly (to prevent curdling), until the mixture becomes thick (like pudding), about 10 minutes. Carefully remove from heat and immediately begin whisking butter pieces into the mixture until all of the butter has been used and is fully incorporated into the curd. Immediately cover with plastic wrap, pressing the wrap lightly against the top of the curd so that it doesn't form a skin. Let it cool completely (it will continue to thicken as it cools). Refrigerate any unused lemon curd. Will keep for up to a week.